It starts innocently enough – a space in the roof, a wooden template to get the right hole spacing, then out come the power tools and all of a sudden there’s a 14″ hole in the ceiling. We knew we’d need a fan to help move air through the van. Because we intend to put a lot of solar panels on the roof, we wanted to put the fan as far back as possible. On a 170 wheelbase van, that means putting it just in front of the rearmost roof rib. There are some kinks in the roof at that point – you can see them in the piece we cut out – but it’s easy enough to slide the fan housing between the roof and the top of the kinks with a bit of persuasion and some metal bending. We chose to use a Maxxair MaxxFan 7500K fan. It can still run even if it’s raining (important in the Pacific Northwest) and you can drive with it open (important for forgetful people). It comes with a remote control. We thought that the remote was a stupid luxury, but with the bench seat in the third row position it’s hard to reach the controls from inside the van. The remote solves that problem pretty well, and it’s actually got quite a sensible button layout and display. The fan expects to have at least 1-1/2″ of interior depth to slide in to, so I asked my neighbor Ken whether he could put something together for me. He’s a high-end cabinet maker by trade, and he couldn’t help himself. He found some pieces of mahogany in his shop, cut them to size, and used spline joints to hold them together. Even if the multiple levels of waterproofing fail, that frame will still stand up. It turned out to be really important to clamp the joint before the Sikaflex glue between the wood spacer and the ceiling metal set. The screws from the fan mount did not pull the wood up as tight as they could have, especially through the layer of butyl sealant tape that we put under the fan mount. Then, we added a layer of Dicor self-leveling lap sealant over all the joints to stop water from even getting near any gaps. It’s really scary to make holes in a perfectly good brand-new van. It gets easier as you go along though. After doing the fan install, pretty much every other hole we make will be smaller and less visible. There are full write-ups on how to do this job on the Sprinter Forum. Dave Orton’s original install, with aluminum strips to prevent the fan mount screw areas from cracking. Atulin’s install over a rib area. There’s also a conversation on Maxxfan versus Fantastic Fan (the two big fan companies). just curious if you’re planning on still using the plastic interior flange that comes with the fan? I didn’t even think about why they provided such long screws… I just have mine sticking into thin air 🙂 I think I’ll just stab rigid insulation up into them. also curious if the wood frame is constant thickness? I hadn’t realized how curved the crown of the vehicle is (at least my ’05 T1n was). I’ll still use the plastic surround that came with the fan. I might spray it black before I install it. The wood looks nice, but doesn’t match the rest of the interior. It acts as a good furring strip to bolt the ceiling panels on to. Found your site via link on sprinter source. You mention the fan having a setting where it comes on at certain temps, giving peace of mind while leaving your dog inside – how does that work? Also in the PNW, and also looking at van partially to be able to bring the dog along. We’ve not had the dog in the van during warm enough weather for the fan to cut in yet. We’re hoping to get more trips in soon that would help us test it out. With window shades in every window (made from foil backed foam), and with the fan on 50% speed, the van got no higher than 75 degrees on an 85 degree day in direct sunlight. Overall we’re not completely confident that it would stay cool enough during hot summer weather. The main source of heat into the van appears to be the windscreen area. Even with a reflective foam shade, this area creates some heat. The van walls are sufficiently insulated that they were not any warmer than ambient. We are planning to create an air vent in the floor that will draw in comparatively cooler air and circulate the air in the van better. We may even build a swamp cooler that fits under the van and connects to the air vent. Remember, other vans may differ – our roof is almost completely covered by solar panels so a lot of the direct heat it would normally receive is deflected. Our walls and ceiling are insulated with Thinsulate, Low-E foil backed foam, plywood, closed cell foam and fabric layers. A bare van would get much hotter. what do you mean by “voiding the warranty”? Half joking really. 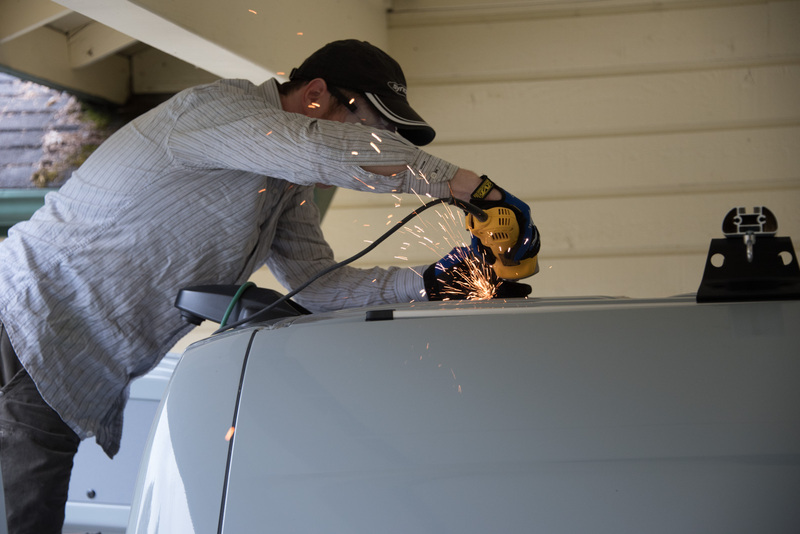 Adding aftermarket parts does not void warranties. However, I think it’s unlikely that Mercedes would honor a paint warranty claim in the area immediately around the 14″ square hole I made in the roof. Or around any of the other holes I’ve subsequently made in the van. i’m in the process of converting a 144″ sprinter 4×4 cargo van. i’m thinking of using a 15″x30″ sun roof such (link at bottom) rather than the usual 14×14 vent. the location would be over our bed (which is raised 36″ above the floor, installed crosswise). the benefit of a sunroof would be the ability to sit or stand in the bed with a 360 degree view outside, or to lie in bed and see stars at night. the sunroof glass is supposed to be removable. there seem to be 2 negatives. one is preventing bugs from entering when venting. my thought is some porous foam would work. the other issue is venting during rain. my thought is create something similar to a tent fly above the sunroof using some homemade roof rack crossbars. 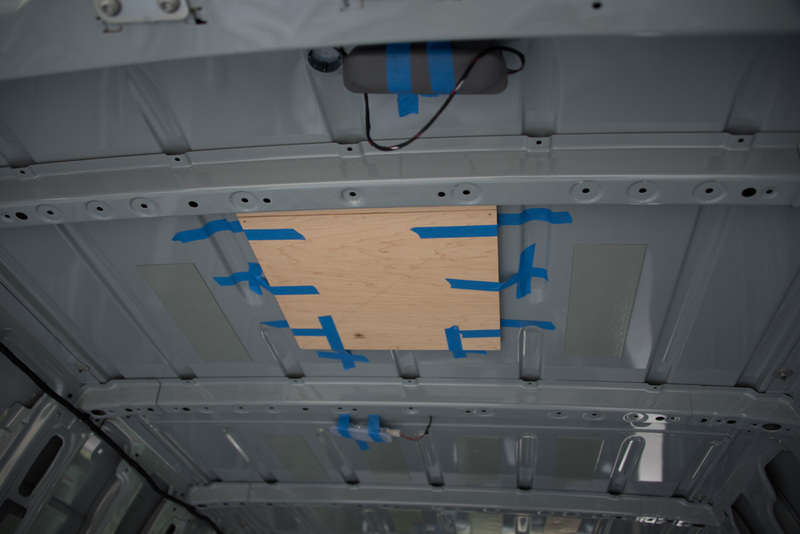 i am also considering dave ortons use of a 4″ square floor vent since we are not planning to add any windows and the van is a stock cargo van. i’ve never heard of this done before, and of course am concerned about cutting a 15×30 hole in the roof. all your critical comments are therefore welcome. Milt, the idea of a sun roof that’s large enough to pop your body through is very enticing. In combination with the floor vent you’d probably get a good draft through the van. You’ve already thought about two of the issues – bugs and rain – but there are a couple of other considerations too. Overnight you might well want to shut out the light coming through the sun roof if you’re parked in an urban area with street lights. Our vent fan is above our bed and we find that light really annoying when we’re trying to sleep. During hot days you’ll also want to shut out the light/heat that will stream in through the glass. Neither of these are insurmountable issues though. 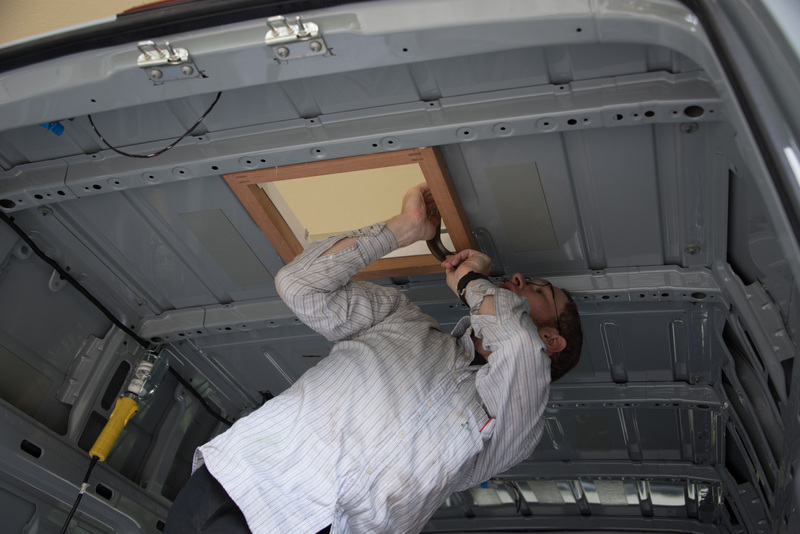 There’s no flat area on the roof of the van large enough for a 15×30 window, so you’ll probably have to make a form to go around the opening so that the roof corrugations don’t cause you problems when you mount the window. You’ll probably also want to build spacers inside the roof metal the same depth as the roof ribs/beams. 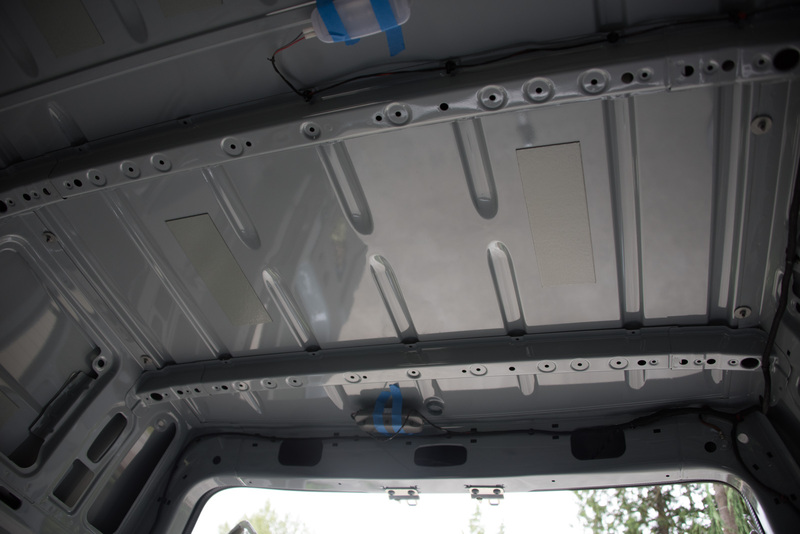 That way, when you add a headliner or ceiling inside the van the window surround will be level with the ceiling rather than the exterior. Another potential issue is security. A 15×30 hole is large enough to climb in to. If you planned on leaving the window open while you were away from the van, you might need to consider other security precautions. I’ve seen super-high roof Sprinters with factory sun lights in the roof. Not sure if those open or not though, and they are in the fiberglass part of the super-high roof. There are no insurmountable issues with what you’re proposing, and it would be really cool to have that functionality. Good luck making holes! Adam, we’ve spent a couple of nights with temperatures in the 80s and it wasn’t pleasant. The Maxxair fan does provide a good breeze when you have it blowing inwards. Ours is over our heads when we sleep so that helps a lot. 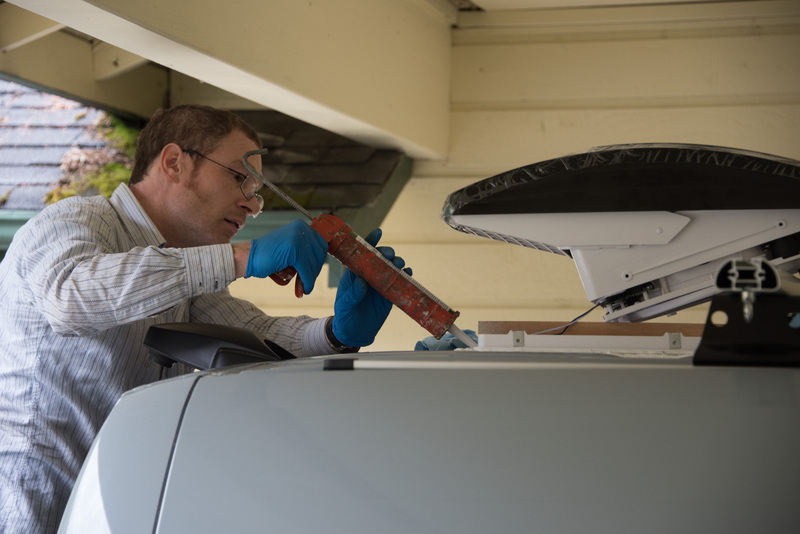 We found we need a way for the air to escape too – an open window or door – otherwise the fan just can’t move enough air through the van. The air conditioner would solve that problem so long as you have a power supply for it, you can sleep through the noise of it running, and you don’t need the roof space for anything else like solar panels. If you have the AC unit and the fan mounted on the roof, there will be very little usable additional space for other stuff. You can offset the fan from the center line of the roof if you need to provide a larger footprint for a solar panel. We are seldom parked somewhere that would have a power supply we could use for air conditioning. Because we use the van to get out into quiet places, we’d never carry a generator. There are loads of warnings on the forum about not idling the engine for long periods of time, so that wouldn’t be a good source of power either. Our 700Ah battery would power the AC for a couple of hours, but it doesn’t seem worth the effort or the cost of upgrading our inverter. Our solution to the high overnight temperatures is to drive somewhere else – either by water (evaporative cooling, canyon breezes) or at higher elevation. Adam, we left a couple of the OEM headliner lights wired up, and moved them to the ceiling coving. In the Crew van, one of the lights includes a 3-position switch to control when it comes on – either off, on with the doors, or on all the time. We moved that light to the rear of the van above the rear doors where there’s a connector for it. Now we can control those lights even when we’re in bed. We replaced the regular incandescent bulbs with warm white LED ones. It would be slightly harder but not impossible to use aftermarket lights and wire in a 3-way switch. Even when you switch the lights on all the time, the van’s computer turns them off after a certain time period (~20 minutes) so they aren’t a good solution if you want them as the only lights in the rear of the vehicle.